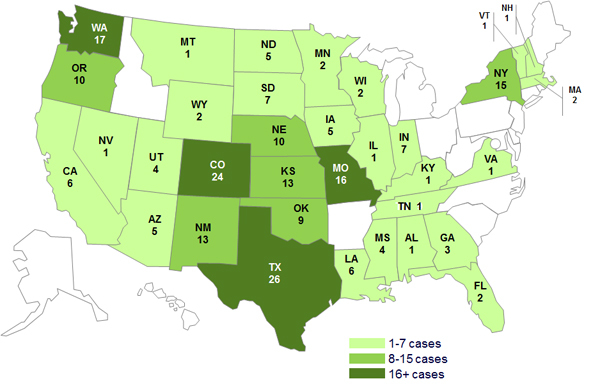 An ongoing outbreak of Salmonella Typhimurium from baby chicks and ducklings has now sickened at least 224 people across 34 states, according to the latest update from the U.S. Centers for Disease Control and Prevention. Of those ill, 26 percent have been hospitalized and 62 percent are children 10 years old or younger. Investigators have traced the outbreak strain back to live poultry purchased from multiple feed stores and mail-order hatcheries around the country, but they are still working to determine the initial source. The number ill by state is as follows: Alabama (1), Arizona (5), California (6), Colorado (24), Florida (2), Georgia (3), Illinois (1), Indiana (7), Iowa (5), Kansas (13), Kentucky (1), Louisiana (6), Massachusetts (2), Minnesota (2), Mississippi (4), Missouri (16), Montana (1), Nebraska (10), Nevada (1), New Hampshire (1), New Mexico (13), New York (15), North Dakota (5), Oklahoma (9), Oregon (10), South Dakota (7), Tennessee (1), Texas (26), Utah (4), Vermont (1), Virginia (1), Washington (17), Wisconsin (2), and Wyoming (2). Health officials recommend anyone handling live poultry to take special precautions and thoroughly wash their hands after contact. Young children are especially vulnerable to Salmonella infection and should be monitored carefully if handling chicks or ducklings. Food Safety News recently produced a video on safe chick handling in anticipation of chick season: Anyone who fell ill from this outbreak after May 13 might not be included in the case count due to the time it takes to report illnesses. 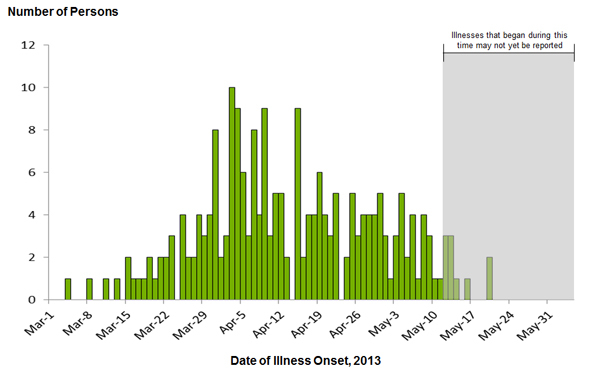 Graphics courtesy of CDC.